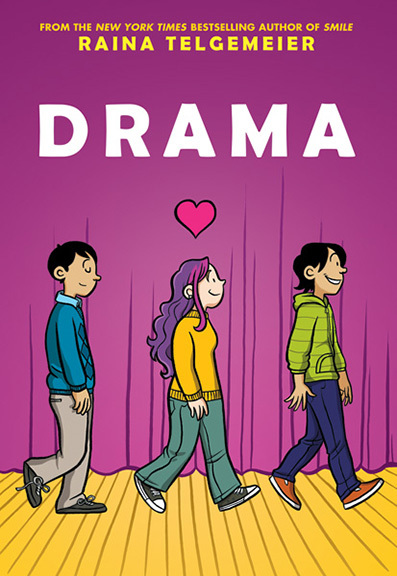 DRAMA, by Raina Telgemier, is really unique and cool. Its about a middle school girl named Callie. She is part of the stage crew for school plays. The school is putting on a production of “Moon Over The Mississippi”. Callie has the job of set design. When they start working on the show, Callie has hundreds of ideas. The one that she’s most exited about is a cannon that shoots confetti in scene 4. 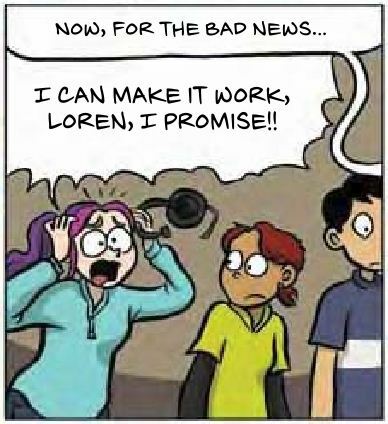 She convinces the drama teacher to use the cannon after much debate. Later that day, she meets two twins, Justin and Jesse. Justin wants to sign up to act in the show. Both the boys had memorized all of the lines for every character. Callie gets a crush on them and the rest of the book revolves around that. The artwork in DRAMA is very flat. It also happens to be four colored. There is very little shading. All the colors are mostly flat against the characters. The expressions are really specific. You can tell if characters are humiliated, confused or disappointed. I have read some of Raina’s other books, like Smile, an autobiography about Raina’s horrible experience with braces. These books are mainly oriented towards girls because they’re mostly about teenage girls in middle school who are boy crazy. But guys can enjoy them too. I’m a guy, and they entertained me. Over all I would give DRAMA a 4 star rating. It sounds like this is a great book. I look forward to checking it out. Happy New Year! i know what your talking about. my middle school never had the slightest prop. Is this at your old middle school? I think the headmistress of your present middle school could whip up an entire set out of Popsicle sticks and chewing gum, because she is MacGyver! "But guys can enjoy them too. I'm a guy and they entertained me." an unbiased reviewer I can trust! I'm glad you started this blog. I'm a middle school English teacher, and I always need ideas for graphic novels! This one sounds like a good intro to the genre for those who may not normally gravitate to graphic novels. I'm interested in hearing about that Feynman book in your picture! You are the third person to recommend this book, so it's in the stars for me to read at this point. I loved Smile too. I'm wondering, have you read the Plain Janes by Cecil Castellucci and Jim Rugg yet? It's one of my favorite graphic novels and this one sounds a little bit like it to me.